Our kitchen is fully equipped with a full size refrigerator/freezer/ice maker, dishwasher, oven, range, hood/fan, microwave, cookware, dishes and tableware. Yes, a crock-pot and a portable mixer are among the furnishings. A full size dining table, 4 chairs and a bar w/3 barstools provide dining pleasure. Inside the condo, a utility room is provided to the immediate right of the entry door. Thus weekly storage of beach toys, chairs and such should not pose a problem. refrigerator/freezer/ice maker, dishwasher, oven, range, hood/fan, microwave, cookware, dishes and tableware. Yes, a crock-pot and a portable mixer are among the furnishings. A full size dining table, 4 chairs and a bar w/3 barstools provide dining pleasure. Inside the condo, a utility room is provided to the immediate right of the entry door. Thus weekly storage of beach toys, chairs and such should not pose a problem. 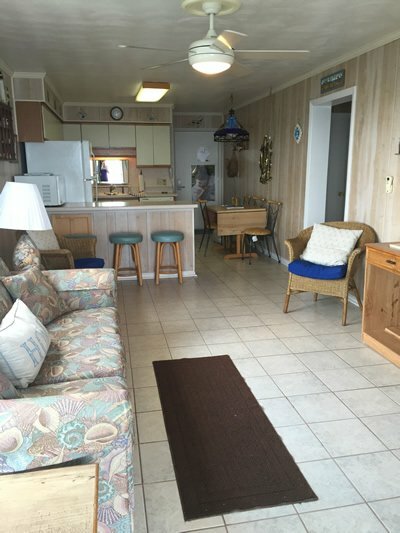 The light paneling throughout the condo is a plus for the beach feel. 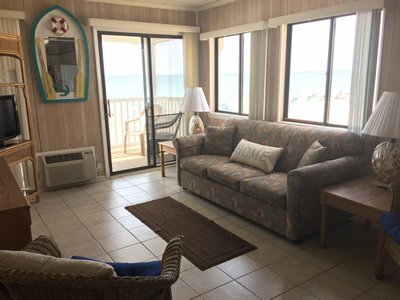 C310 is a third floor, corner unit facing the beautiful Atlantic Ocean. Windows on two walls of this room bring the ocean inside and view is extended onto the oceanfront balcony. A queen size sleeper sofa anchors this room. In addition to the Atlantic, color television w/cable, a VCR and DVD are available for your use. A full size credenza with drawer space for extra clothing, games, books or other family needs. C310 is equipped w/two air conditioning/heater units and two ceiling fans for the maximum comfort. Mirrors are used throughout the condo for light and reflection. There are 2 full size baths in this unit. One bath is in the hallway and the second in the master bedroom. Both have full size tubs and shower units. The second bedroom features twin beds, ceiling fan, an in-wall air circulator and a clock radio w/cassette player. Pillows and comforters are furnished for all beds. Ample closet and drawer space is available in this unit. 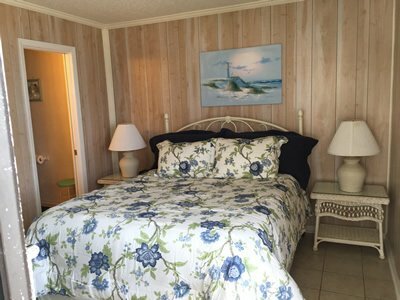 Our master bedroom is also an ocean front room with a large window. The sounds of the waves can be heard year around promoting sound sleep. Sliding glass doors also enter onto the ocean front balcony. 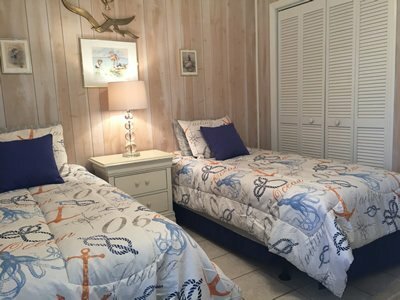 This room features a queen size bed, 2 bedside tables w/lamps and a double mirrored dresser w/drawers, all in white wicker. A small color television and a clock radio w/cassette are for occupant use. Extreme drawer and closet space plus a small mirrored linen closet are provided in this bedroom.